Up until 2007 the Nepalese rupee featured a portrait of the King of Nepal. This is in keeping with other states with monarchies: the obvious choice. But what is the best move when the obvious choice is eliminated? In 2001, Prince Dipendra (who was heir to the throne) got mad, got drunk and, well, machine gunned his whole family including his dad, King Birendra. Dipendra then killed himself. 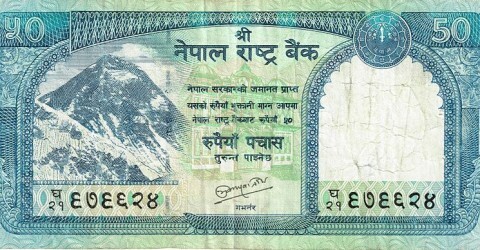 From 2001 until 2007, notes were issued with the image of the new king, Birendra’s brother Gyanendra. As you can imagine the monarchy was a bit of a mess after the mass murder, and no one really liked Gyanendra. Worse, Gyanendra went for hard and heavy rule, which flew in the face of the constitutional monarchy that his late brother had set up. The political parties weren’t into that. The Maoist rebels weren’t into that. Gyanendra wasn’t going to last long with that attitude. And he didn’t. He WAS on the money though. In 2006, during major protests, people were killed and injured during royal government curfews. This made everyone even more mad and, eventually, Gyanendra was forced to reinstate the parliament. Parliament then took away all of the king’s powers. In 2007, all properties that Gyanendra inherited from his brother were nationalised. On 27 May 2008 Gyanendra was told he had 15 days to get out of the palace. Now Gyanendra is not the king of Nepal, although he periodically makes noise about coming back to the throne. This will not happen. So what is Nepal to do in the wake of the fall of one of its major families? Who goes on the money in a country with internal political and social struggles? There really isn’t, like, a hero of all Nepal that isn’t controversial in some way. So who goes on the money? 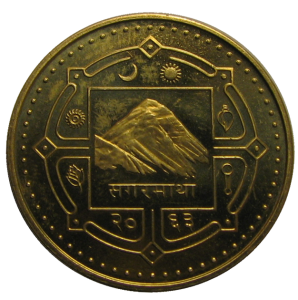 On every Nepali note and every Nepali coin, in the place where a portrait usually is, you will find Mount Everest. I love it. Everest is the king of Nepal. This isn’t as absurd as it sounds. Why have a person at all when you can have a symbol of national pride? Everest is what Nepal is for most of the outside world and, internally, companies that use Everest as a symbol pair it with words like “strong”. A weak king replaced with the strength of the king of all mountains. I don’t know of any other country that has scrapped the whole idea of the portrait on currency. Aside: New Zealand’s $5 note features Sir Edmund Hillary, one of the two people to first summit Everest. It does not, however, have Everest. Hillary insisted that if he be put on the money, the mountain with him should be Aoraki/Mount Cook. A New Zealand peak for a New Zealand bill. The money folks agreed to that (couldn’t say no to Sir Ed). And that is the sum total of my knowledge of Everest currency.